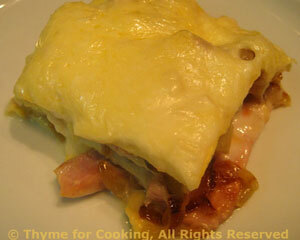 Easy Dinner from Thyme for Cooking: Caramelized Onion and Ham Lasagne. Last night the onions were cooked fast to brown; in this recipe they are cooked slowly to caramelize. Either way, a bit of covered cooking gives them a head start. This is another lasagne without tomatoes.